Stigmatization and discrimination are still common in people with HIV / AIDS (PLWHA). Interview do many people to work in agency institute of PLWHA in the Pekanbaru city (most of them are PLWHA) said that they ever experienc stigmatization and discrimination. 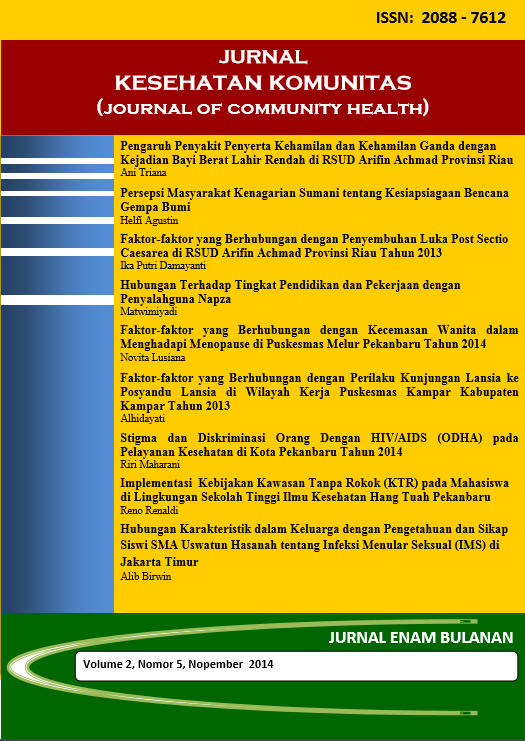 This study was conducted to information about stigmatization and diskrimination on health in the Pekanbaru city of 2014. This research design is qualitative with a phenomenological approach. Informants in this study is 3 people PLWHA and health officials is 5 people. Data was collected through in-depth interviews and document search. The results of this study showed that the issue of the stigma disease of HIV / AIDS are heard by PLWHA to health services is the body people with HIV / AIDS wrapped in plastic and put into crates, mattresses and all appliances former patients of HIV / AIDS discarded and burned, the use of personal protective equipment excessive. Discrimination of PLWHA include verbally abused, coding on status HIV patients, landfills are still distinguishable, inadequate health care / slow, different services, excessive use of protective equipment, isolated, and perform medical acts without giving informed consent . The conclusion of this study is the stigmatization and discrimination PLWHA in health care is still often the case, stigmatization and discrimination PLWHA in health care starts from the registation / emergency room, inpatient, operating room up in the mortuary. Suggestion increase health promotion in a planned and sustainable removal efforts of PLWHA stigmatization and discrimination in health services and advocation to policy makers in the health sector.